Bring Ethiopia to EOR, Inc.
Ethiopian Orphan Relief, Inc. has signed on to sell Ethiopian goods at the Day of the African Child in Portland next month, but we are woefully low on girls clothing. If you are traveling to Ethiopia in the next 3 weeks or so, could you do a little shopping for us? If you aren’t traveling but know someone who will be (a fellow blogger, perhaps?) please send our plea along. We sold a good many of our items at the Lights of Hope Auction and the shelves are a bit bare. EOR is happy to send money with you, or we can reimburse you once you’re home. If you choose to donate items, the donation is fully tax-deductible. As manager of EOR’s webstore, I field numerous emails each week asking about our store’s inventory. Many people ask for a particular item or size. More often, people ask when we’ll be getting new merchandise in the shop. My answer each and every time is a confusing, “I don’t know.” Unlike most stores that purchase supplies from particular vendors, the EOR webstore relies on the generosity of traveling families. While Ethiopian Orphan Relief can supply the funds to purchase inventory, we constantly seek traveling families to act as buyers and schleppers. If you are traveling to Ethiopia in the coming months, or know someone who is, please consider bringing items back for our little webshop. 100% of the profits benefit our partner projects. The orphans of Be’Emnet, Children’s Heaven, SOS EE, AHOPE and Hope for Hossana will thank you. So will I.
Adorable outfit brought back by Cindy. She brought back tons of terrific boy clothes for us. If you think you’re able to shop for us while in Ethiopia, please email me–I’ll reply promptly! The store is open once more!!! Just a note to let you all know that the store is reopened for business. I have a number of orders to ship out today, and will continue to ship orders withn 48 hours now that I’m back from vacation. Although our stock of girls clothing is slim, we have plenty of boys clothes, decorative items, stationery, and of course, lots of items from our terrific independent vendors, including coffee, toys, and jewelry. Your requests for items are not going unanswered. Plenty of generous people have volunteered to purchase items for the store during their upcoming trips. If you would like to help EOR keep the store stocked, we are always looking for people to act as sherpas–you can purchase items for the store as a donation, or for reimbursement. Please email us if you’d like to ferry some things back to the US for us. Well, I have a splitting headache and my eyes hurt–must mean I just finished adding inventory to the EOR Store! We have some cool jewelry from the Art for Ethiopia event (a couple necklaces made by an Denver artist as well as the super fab necklaces made famous that night by the Romanian supermodels–if you were there, you know what I’m talking about! ), really beautiful table linens just in time for the holidays, cute purses (including a multi-colored hobo bag that looks like it came straight from Anthropologie) and lots of ADORABLE boy clothes, courtesy of Cindy the Triplet Mom (who just got back from an epic trip to Ethiopia–go look at her slide show right this minute!). As you know, most of our stuff is one of a kind–if you like it, buy it! Our stock is flying off the shelves. Don’t forget–because she has nothing better to do besides raise her two kids, prepare a feast for and entertain a host of relatives, write a funny blog, homeschool Elliott, take 10,000 photos a day of Astrid and run our store, Paige has offered FREE GIFT WRAP if you order by 11/26! And she’s one of those annoying Martha types who’s really good at making things look all pretty and stuff, so the recipients of your gifts will think you went above and beyond this year…we won’t tell. And, just a friendly reminder, if you’re planning to order any of our custom stuff from the store for holiday gifts (i.e., jewelry, quilts, tutus, dolls, superhero capes, etc.) please do so by the first week of December. Our artisans need ample time to complete your gifts to your exact specifications! I’m waiting for my quilt and superhero capes right now and will post pics when they arrive–they’re Christmas gifts for the kids, but I figure, they can’t read the internet, so it’s cool. The shopping is coming, the shopping is coming! Like the outift above? 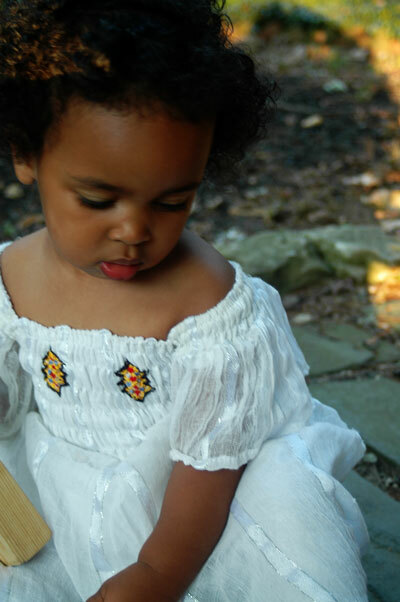 It’s just one of the many items we will be selling through Ethiopian Orphan Relief’s webstore. In just a few days you’ll have the opportunity to buy it, and many other gorgeous pieces. As the official ‘Picture-taker-of-items’ I’ve had the chance to sort through, iron, photo, catalog and enjoy dozens of the beautiful things that we are selling from Ethiopia. It’s hard not to keep it all for myself, especially the jewelry as each piece is prettier than the last. EOR’s store will help Ethiopia more than once–while all of the profits will fund programs to support orphans in Ethiopia, most of the inventory was bought in Ethiopia, much of it from the AWARE Project–a vocational training program for adult orphans previously in care, so the money comes back to the country we all love again and again and again. In addition, we’ll be selling products made by several vendors who support the work of EOR. I hope you’ll shop with us soon, and tell your friends too. Look for an update about the store opening here and on our website–we’re opening very soon! This Fall, Ethiopian Orphan Relief will be hosting its first annual “Art for Ethiopia” event in Denver. This event will be to benefit our Partner Organization Children’s Heaven, and all money raised will be donated to our Facility Project, which will build a facility for use by the orphaned teenaged girls Children’s Heaven supports. If you are an artist willing to donate a work of art for this event, please contact us at info@ethiopianorphanrelief.org. It is our hope that donor artists will provide works that are framed and matted, with all donations of course being tax deductible through EOR. If you are not an artist, but would like to help and are planning to travel to Ethiopia in the next few months, please consider picking up a couple extra Ethiopian goods while there. We are looking for people to donate traditional Ethiopian clothing, jewelry, scarves, home decor and works of art to be sold at this event. All donations will be tax deductible, and anything that does not sell at the event, will be added to the EOR Web Store where all proceeds benefit our organization and programs. If you’d like to help, please contact us at info@ethiopianorphanrelief.org.